Register Your DriverFinder Download and Update Old Drivers, Install Missing Drivers and Fix Device Errors Instantly! Your registered copy of DriverFinder comes with your own personal license key, unlimited driver downloads and direct access to world-class Customer Support. For only $39.95 for a 1-year license (no recurring, or auto billing), keep your drivers updated and your PC running smooth with award-winning DriverFinder! 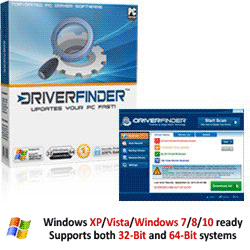 * FREE BONUS: Instead of on just 1 PC, install DriverFinder on up to 3 PC's - a $60 USD value - absolutely FREE! Get Your Premium Version of DriverFinder! YES! Please extend my license for unlimited driver updates to 2 years for only an extra $9.95 USD. Order in Confidence! We have a full 30-day money-back guarantee in full effect for all orders! If you are not completely thrilled with your purchase, just let us know and we’ll provide a full refund, no questions asked. You have nothing to lose, and an updated smoothly running PC to gain! Purchase the premium version of DriverFinder risk-free and enjoy the all the benefits it has to offer!